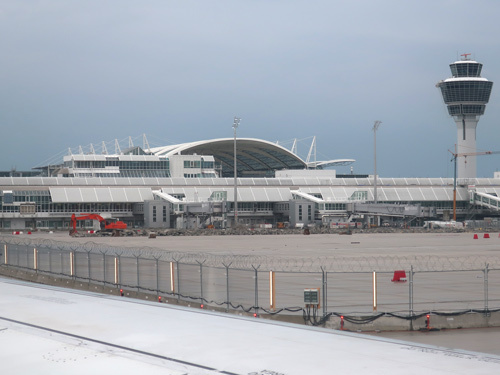 The international airport in Munich Germany is officially called the Munich Franz Josef Strauss Airport (Flughafen München-Franz Josef Strauß). It has two passenger terminals. Munich Airport (MUC) is located 28 km northeast of Munich. It is Germany's second busiest airport, after Frankfurt Airport. In addition to being a hub for Lufthansa Airlines, many other national and international airlines provide service to the Munich airport. Passengers arriving at Munich's Franz Josef Strauss Airport can easily travel to Munich via the S-Bahn (Commuter Rail Service). Lines S1 and S8 run from the airport. Travel time to the city centre is approximately 45 minutes. For real-time flight arrival and departure information at the Munich Airport, please visit the official website.